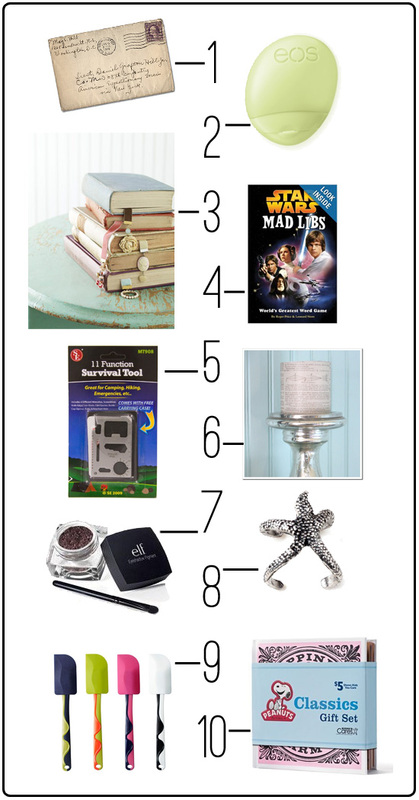 It's time for our 3rd annual $5 and Under Gift Guide! 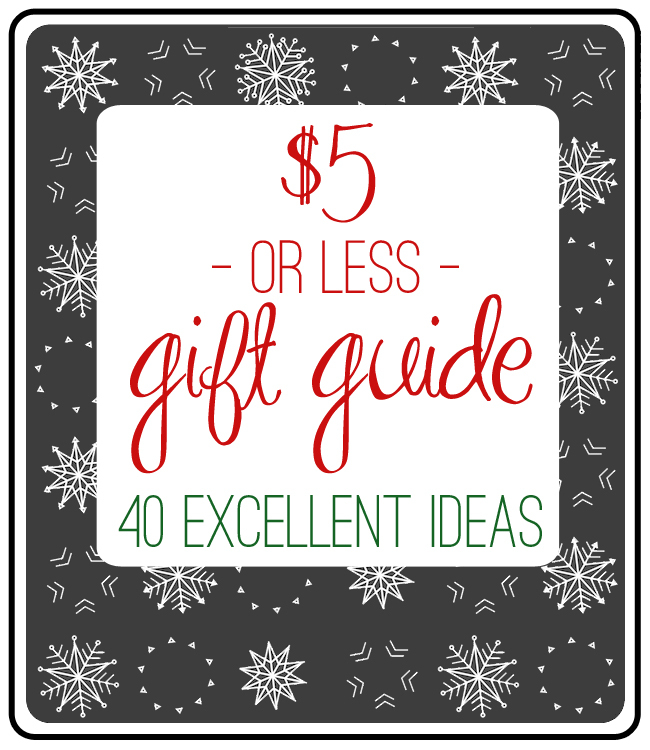 For the past 2 years Janssen and I have put together gift guides to help you shop in that elusive under $5 range. Here are our picks for this year! I say this every year, but the trick to giving low-cost gifts is presentation. Pick up some pretty ribbons from the dollar store or turn to Pinterest for cool wrapping ideas. My mailbox is kind of a sad, impersonal place. At this point it's all bills and Amazon deliveries. Occasionally, I get a handwritten card from my uncle who lives in LA (he's GREAT at that kind of stuff) but he's really the only one who ever sends me anything personal. A hand written note in my mailbox would be the best kind of gift. My sister introduced me to this stuff. EOS is a fantastic brand (they shoot for natural ingredients and their products are paraben free) and I'm already a fan of their lip balm. The hand lotion comes in a slim little bottle that easily slides into your purse pocket. You could probably even afford to wrap this up with a candy bar or an EOS lip balm. As someone who is always scrambling for a receipt or something to use as a bookmark, I think these would make a great gift. Use old earrings that you don't wear anymore to embellish! Even better, gift it with a thrifted copy of a favorite book. I have a few Star Wars super fans in my family. This would be perfect! Perfect for the preppers (or campers) in your family! I used to have a TON of candles on hand for emergencies, romantic evenings, etc. but I accidentally left them in a box in the garage during the Arizona summer. Yeah, they don't look much like candles anymore. Something like this is right up my alley. Include a classic little box of matches and tie up with red ribbon. It even comes with a brush! Love this super cute little ring! Starfish anything always reminds me of Charlie's Angels and how The Chad always called Drew Barrymore's character "Starfish." Tom Green, man. I actually desperately need a new spatula or two. These fun multicolored options from Ikea would be super cute with a recipe for cake tied on with some ribbon! Includes "Happiness is a Warm Puppy" and "Christmas is Together Time." I can think of at least 4 different families I'd like to give these books to. Package a cheap polish with a cute emery board (you can find them for $1 at places like F21, Charming Charlie, Claire's, etc.) 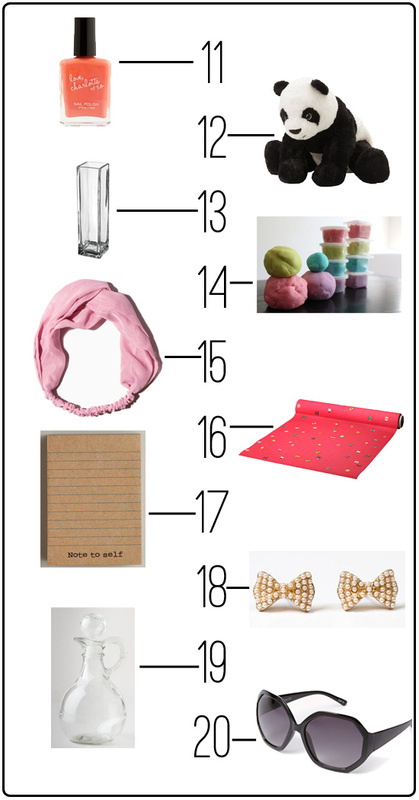 and you've got a perfectly girly gift. Perfect for nieces, nephews, or other special kids in your life. Would be darling with a big red bow around his neck! I used to be swimming in vases but over the years they've slowly been broken, tossed, or given away so I'm down to two. Fill this cheap vase with greenery from your neighborhood and a few flowers from a cheap grocery store bouquet. It will look like a million bucks. I saw on a blog once that a woman made play dough for the older children of a woman with a new baby. I was like, "YOU....are a genius." Since reading that I love stopping by with a few colors of play dough and a couple fun tools (a chopstick, a plastic knife, a thick cardboard wrapping paper tube that I chopped to rolling pin length, etc. Usually stuff I have on hands). The kids love it and mom gets a little break. For the girl who isn't afraid of fun hair accessories! I'm a BIG fan of table runners for fancy occasions (I keep a big roll of paper on hand just for that! It's under $5, by the way, and would make another great gift). I love this cheery ornament one that can also be split apart into 12 placemats. Multipurpose! There's something so homey about brown kraft paper. Package this simply with a ribbon and maybe a new pen. Who doesn't love getting jewelry for Christmas? This 10 oz bottle is perfect for homemade dressing. Or bottled dressing you're passing off as homemade in a fancy cruet. I won't tell. I was just reading some article the other day about iconic...something. Women? Styles? Can't remember (I read a lot of those kinds of articles) and one slide had a pic of a woman wearing hexagon sunglasses. And I was like, "WAIT that's a thing??" And then, sure enough, F21 has them. And they're fab. Janssen really killed it this year with her picks. Hop on over to see the other half of the guide! So fun. Something Star Wars that isn't outrageously expensive!